Sprawling apartments still trouble eastern N.O. A Realtor trying to sell the largest apartment-zoned property in the metropolitan area said a new housing complex is just what eastern New Orleans needs to help bring businesses back to the area. The only problem is those already living in the area are more concerned with apartment buildings that are still unoccupied and in disrepair since Hurricane Katrina. Tangee Wall of the Eastern New Orleans Neighborhood Advisory Commission said residents want more businesses and less multifamily housing in the area. “A desire for our community would be to have businesses and community gardens (at the site),” Wall said. The area already has an ample stock of apartment buildings, many of which are blighted. “There are some that are in imminent danger of collapse and … those need to be demolished,” she said. 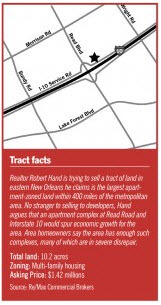 Robert Hand, an agent with Louisiana Commercial Realty, is listing the 10.2-acre site at Interstate 10 and Read Boulevard for $1.42 million. An empty concrete field is all that’s left of what used to be the Bern-Mas Apartments, which was destroyed during Katrina. Hand insists eastern New Orleans residents are not necessarily against his project but the continued presence of blight, which consists mostly of abandoned apartment buildings in the area. According to Hand’s analysis, there are 10 other apartment complexes ranging in size from 200 to 350 units within a five-minute drive of his property. Many of the apartments are Section 8 housing designated for low-income tenants receiving government subsidies. Just west of the Bern-Mas site are the Worthy Place Apartments, a group of light-colored and nondescript rectangular structures. It and several other apartment buildings throughout eastern New Orleans have signs advertising vacancies. On nearby Cindy Place Drive, the streets are lined with empty and boarded-up apartment buildings, some of which are being gutted and many of which are in ill repair. 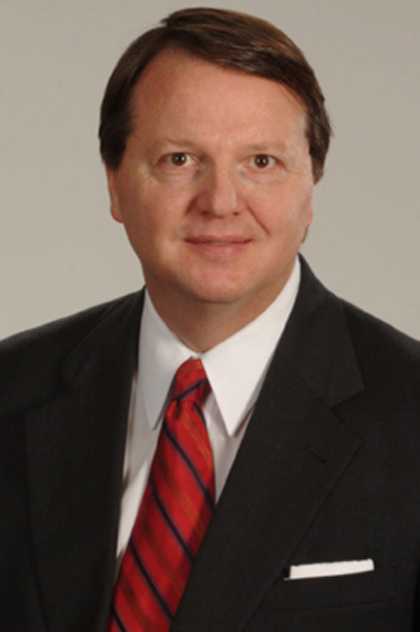 Coldwell Bankers Realtor Graham Little lists two of the properties. The 60-unit buildings, listed for $499,000, are fixable and will not be torn down, he said. “We’re working with a number of developers now that can renovate the property,” Little said. Apartment occupancy in eastern New Orleans was 80 percent according to the spring Greater New Orleans Multi-Family Housing Report from Madderra and Cazalot, Larry G. Schedler and Associates Inc. and the MultiFamily Advisory Group. With available inventory and more construction proposed, the potential for an apartment glut has caught the attention of District E City Councilman Jon Johnson, who says multifamily housing in the area is not a priority. “I think the push now is more toward single-family housing more than anything else,” he said. Estimating the area’s population now at 65 percent to 75 percent of pre-Katrina levels, Johnson said his district still faces “basic family needs” such as schools, libraries, parks and grocery stores. Hand said similar deals he has brokered in the past have spurred commercial development around them. He points to The Preserve and Crescent Club in Mid-City and the Marquis Apartments on Poydras Street. All three were built on the site of vacant commercial properties. “These are developments that worked,” he said. He said businesses are starting to come back to the area, and more will follow as new and renovated apartment projects are built. He points to the former Lake Forest Shopping Center and the redevelopment of Methodist Hospital. In July, Mayor Mitch Landrieu announced plans to buy the Methodist Hospital site for $16.25 million and to have a medical facility open its doors there within three years.